Review: Danny Ocean brings back the guys for a third heist. This is after Willy Bank, the casino owner double crosses Reuben Tishkoff, one of the original eleven. In my view you can’t beat Ocean’s Eleven (2001). Just a bunch of guys having fun. The poster says it all. This is just all over the place. I honestly couldn’t tell you what the plot synopsis is. Standing in just over 2 hours I did find this on the long side. 15 mins at least could have been taken out. 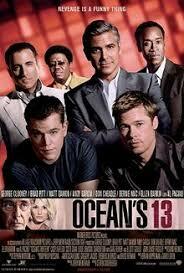 As bad as this is I did enjoy it more than Ocean’s Twelve (2004). All I needed to do was watch the trailer as it has all the best scenes in. Watching all the scenes of Las Vagas did not appeal to me or made me even want to go there. The poster says it all: six actors turning up for a cheque for not doing very much at all.